Feathered dinosaurs that walked on two legs and had parrot-like beaks shared another characteristic with modern birds—they brooded clutches of eggs at a temperature similar to chickens, a study showed Wednesday. Ostrich-sized oviraptors, ancestors to birds, sat on their eggs to incubate them at 35 to 40 degrees Celsius (95 to 104 degrees Fahrenheit)—a range comparable with modern hens (37.5 C), researchers reported in the journal Palaeontology. 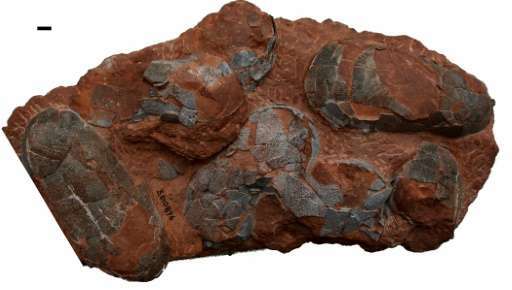 A team from China and France measured oxygen atoms from the shells and embryo bones of seven oviraptor eggs from the Upper Cretaceous period some 100 to 66 million years ago. The analysis revealed the temperature at which the embryo was forming during its incubation, explained study co-author Romain Amiot, a paleontologist at France's CNRS research institute. Amiot and a team used the eggs of oviraptors because they are known to have been egg brooders. Several fossilised adult oviraptors have been found in a brooding posture on clutches of eggs. In fact, this is how the creature got its Latin name—unfairly—of oviraptosaur, meaning "egg thief lizard". The first specimen was discovered in 1924 on top of a nest full of eggs, leading palaeontologists to assume the creature was eating them when it died. But later finds revealed the eggs in fact contained baby oviraptors, meaning that the lurking lizard was not a predator but a caring parent tending its nest. Whether dinosaurs were warm- or cold-blooded has been a longstanding scientific riddle. In 2015, a study suggested they were neither, but something in-between. Dinosaurs were probably able to produce internal heat and raise their body temperature, but not maintain it at a consistently high level as modern warm-blooded animals do, it said. Raising their body temperature above the ambient range would have allowed dinosaurs to withstand cold climates at high latitudes—like penguins hatching their eggs in freezing conditions. 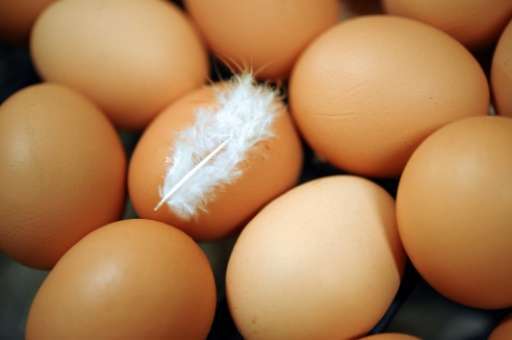 The latest study suggests that oviraptors "had a body temperature at least as high as the incubation temperature" of the eggs analysed, said Amiot. Active brooding would almost certainly not have been a universal dinosaur egg-hatching strategy, he added. "It is hard to imagine a diplodocus sitting on its clutch... without breaking its eggs or destroying the nest," Amiot said. Some 30 metres (98 feet) long and weighing more than 10 tonnes, Diplodocus was one of the largest animals ever to walk the Earth. Fossil evidence has shown that some dinosaurs warmed their eggs by burying them, while others put theirs in nests of vegetation that gave off heat as it decayed. Baby Born and Milk in Breasts ARE DIFFERENT ! CAN AI Help; Let DeepMind Ask a Chicken.